← The Good with the Bad: Kogan Mobile SIMs delayed again! Finally, I have managed to purchase a fourth Toshiba 3Tb 7200rpm drive to make my 4x3Tb array complete, but interestingly, this drive was from a newer batch. The previous three came from the September 2012 batch which featured mention of Hitachi and Toshiba on the label – the newer one from December 2012 has done away with all mention of Hitachi, despite being physically identical. It’s taken me a while to certify the health of all the drives – this involves a complete random pattern write and three read-backs which are MD5 compared to ensure consistency. Then I check the SMART data for health just to be sure the drive isn’t reallocating sectors (i.e. all factory tested good sectors were good) or showing any other health issues prior to commissioning the drives for use. Last year, it was a disappointment when I had 8kB lost in my 10Tb dataset. 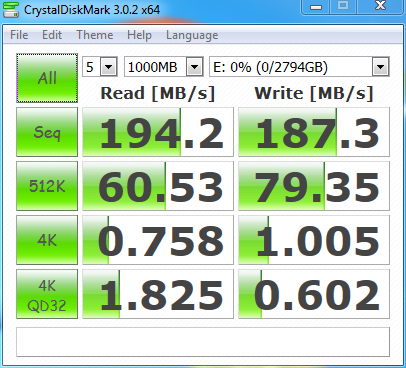 But then again, that’s not too bad – the drives are specified for one unrecoverable read in 10^14 bits read – i.e. 1 in 11.368TiB! Okay, now that is scary information for those with large datasets, but I have experienced silent corruption as well previously, and the MD5 check ensures that the drives are “honest”, and the CPU/RAM is all good as well. Having shoehorned the drives into my mATX box, which has now been upgraded to a Gigabyte B75M-D3V motherboard (for GbE, SATA III, additional SATA II ports and USB 3.0), we’re ready to roll and give this thing a bit of a test! These tests were all conducted on SATA II 3Gbit/s ports despite 6Gbit/s support on the drives – this was due to a lack of 6Gbit/s ports (there is only one on this board), and the fact the only constraint on transfer rates will be the burst buffer-to-host transfer as the media transfer rate is still slower than the SATA II limit. So far so good, these rates look pretty amazing – in fact, these rates are beginning to encroach on first generation SSD sequential rates. We would have dreamed of such high transfer rates only a few years back, and now it’s a reality! 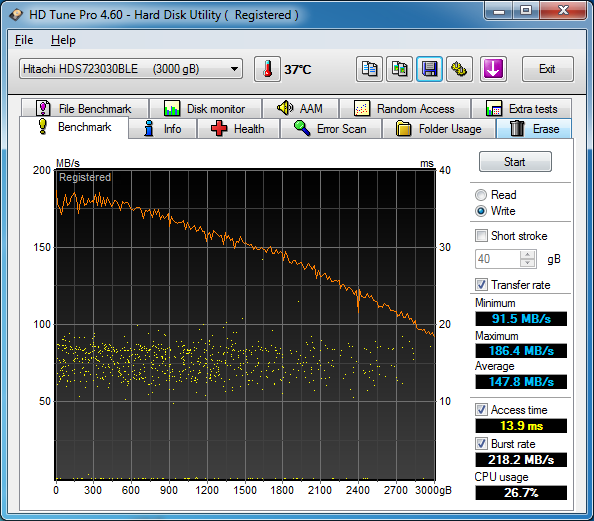 SATA I would not keep up with this drive! Looking at these numbers really does paint a good picture for the drive. With it being competitively priced, at similar prices to green-class drives (which see approximately 140Mb/s sequential reads, and higher rotational latency), this drive does offer better performance for the price, but at the cost of power consumption and possibly noise. But it does do what I need it to do – be big, fairly quiet and cheap! 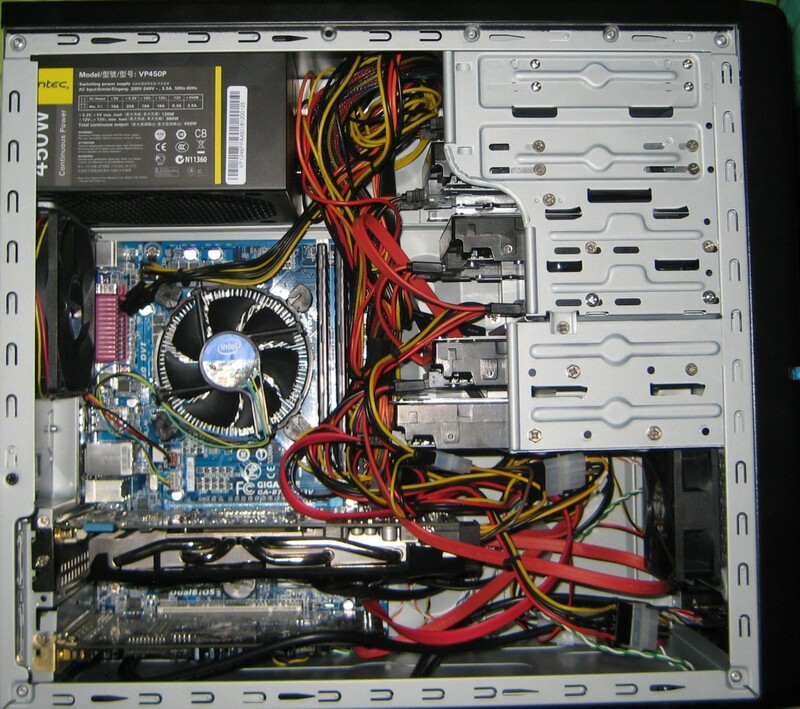 This entry was posted in Computing and tagged computer hardware, new stuff, storage. Bookmark the permalink. I was wondering what speeds you got in your array with these drives? They seem to burst fairly fast but I am not get n times the speed as I should in a RAID10 array. Maybe one or two of my drives need to be RMA’d, as the burst speed is often high while the speed is quick to slump down to the performance of a single drive in the RAID configuration. Is there some firmware available for this drives? I’m having problems to get them work with synology, so I wanted to try will firmware upgrade if available can fix my problem? There’s no firmware upgrade for these drives to my knowledge. If it doesn’t work with your NAS, you might have to choose other drives which are on the approved list of drives. Other drives can cause instability, especially in RAIDed NAS configurations. I am about to order a few of these drives & came across this little write up…. So what tests do you run re… complete random pattern write and three read-backs which are MD5 compared to ensure consistency. If you could share this i would very much appreciate it…. I’ve decided to reply to both your comments in the one posting – see here. 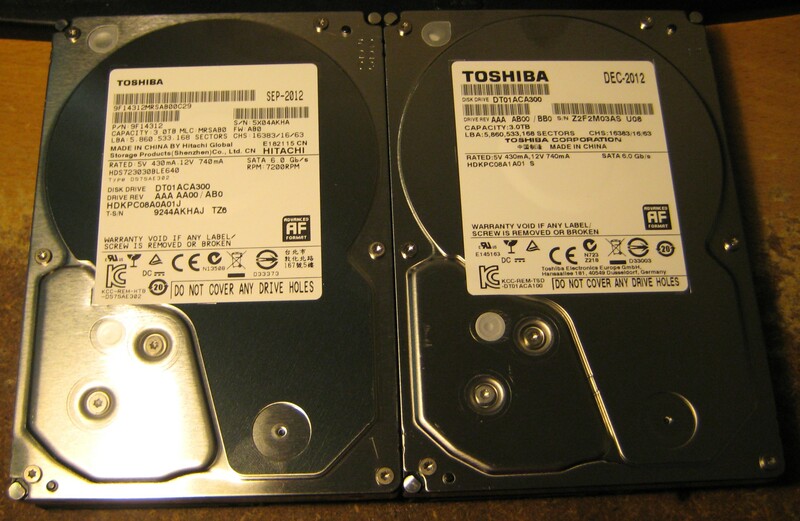 Pingback: Toshiba Hard Drive Test: How Do They Stack Up? I use a hex editor like WinHex under Windows – that takes a while. I’ve also also achieved the same under Linux using dd (using if=/dev/urandom but due to entropy limits, the fill speed is predictably slow), although you should double check your path to ensure you’re not overwriting needed data. DBAN can also do full fills and verifies, and DBAN’s PRNG is much faster, which has become the preferred method for me at least for data destruction and drive filling. Verification and MD5-ing can be done by piping dd into md5sum. If not, you could also use H2testW which is normally used for testing flash, although its patterns are not as random.